This sounds like something out of the Duff Beer factory tour on The Simpsons: This weekend, Churchill Downs will boast a 6 ft.-tall, 206 gallon mint julep. The Early Times concoction, located at the Paddock area near Gate 17, will come complete with a mint sprig and straw. It will be a fully-functional dispenser, capable of serving more than 5,000 juleps. On Derby and Oaks days, it will be the main filling station for julep vendors -- the guys who yell, "MINT JUUUUU-LEP!" Keep Barney and Homer away from the fountain, and check back here tomorrow for more on the much maligned julep. I'm sitting here at 5:19 p.m. waiting to watch the 5 p.m. Derby draw, and they're playing soccer post-game analysis on ESPN2. WTH?! Better check in with Alicia. Cybill Shepherd and Jenny McCarthy partied at last year's Barnstable Brown Derby Eve Gala. McCarthy will be at another event this year, and (below) the Barstable twins, Patricia Barnstable Brown and Cyb Barstable, shown with Dixie Chick Emily Robinson, may be holding the secrets to this year's biggest stars until Friday morning. Copyrighted Herald-Leader photos by David Perry. Where's the remote, where's the remote . . . ah. We're flipping the dial here at Copious Notes to talk Derby . . . all Derby, all the time through Saturday, when I'll be blogging live from Churchill Downs. I'll be your regular guy in a seersucker suit out there, trying to spot those bits o' culture that make Derby unique, trying to spot the race without a ticket to the good seats, trying to spot a winner and trying to spot some celebs. Speaking of celebs, who's coming? Usually by this time of the week Derby week, we pretty much know who to expect and we're running down rumors -- sorry kids, apparently no George Clooney this year. But we'll always have Maysville. The Grand Gala is the big party with the big list, thus far, and the guest list includes Rush Hour(s) star Chris Tucker, American Idol winner Taylor Hicks, basketball and Hanes commercial star Michael Jordan, film star Gabrielle Union, and newly single talk show host and attorney Star Jones. Also on the list for the Derby night soirée are Project Runway standout Mychael Knight and stage and screen standout Jeffrey Wright -- if all you've seen of his work is Casino Royale, you haven't seen enough. In addition to Jordan, sports fans can look forward to seeing NBA star of the past Julius Irving and present Kevin Garnett, and football stars Byron Leftwich and Michael Strahan. If you feel like mingling with these folks, or you want to "Sing a Soooooong" with party band Earth, Wind and Fire, click the link. Tickets are still available, but you have to reserve by the table. You could also mingle with Jenny McCarthy, the marquee name at Snow Queen Vodka's first annual -- don't you love the optimism of that term? -- Derby Eve bash at the Frazier International History Museum for $400 a head. For a bit less . . . OK, a lot less . . . foodies can revel in Bobby Flay as the grand marshall of the Pegasus Parade on Thursday. Celebrity celebrity interviewer Billy Bush will be around town and at the Downs for Access Hollywood's pre-Debry show. The biggest name thus far is Justin Timberlake, who will be a guest of Budweiser Select race day. We say thus far, because the Barnstable twins are holding out their guest list until Derby Eve, and the Barnstable Brown Derby Eve Gala usually hosts some of the biggest names of year. Hmmmmm. Who could be on it? Muhammad and Lonnie Ali are having a Derby Day event with some sports luminaries such as Lennox Lewis, and if you like the politics, ex-first daughters Chelsea Clinton, supporting her mom, and Caroline Kennedy Schlossberg, supporting Sen. Barack Obama, will be at the race. Don't miss the Herald-Leader Photo site's Derby celebs slide show. How did we forget mention Joe Piscopo at the Mint Jubilee? Maybe it was this scary picture of the former Saturday Night Live star that's been attached to some stories about the event. The promise that he'll do a little Sinatra makes this event appealing -- maybe we could get a taste of The Sinatra Report. The video below is reportedly Joe doing a Sinatra tribute in Sacramento. Dizmas are (L-R) bassist Nick Aranda, drummer Clayton Hunt, singer Zach Zegan, guitarist and vocalist Josh Zegan and guitarist Jon Howard. 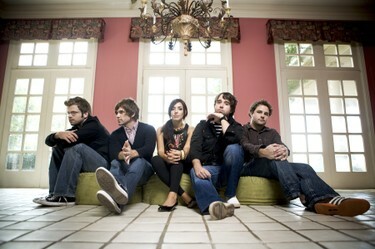 Photo by Jared Martin for Forefront Records. It's always a good sign when you're listening to an album if your fingers drift over to the volume button to turn it up. Something's caught your attention and you want more. 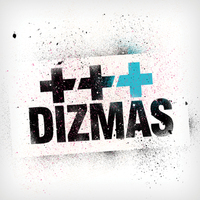 Dizmas has several such moments on its new self-titled album, affirming Forefront Records made a smart move bringing the act into its fold. In the press release announcing the move -- which was inside the EMI family, from Credential Recordings to Forefront -- it was billed as demonstrating Dizmas', "focus and commitment to the Christian marketplace," which makes sense. 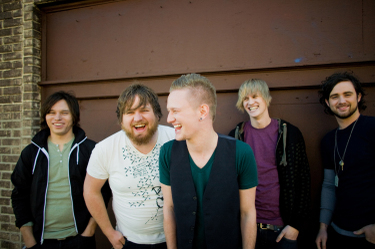 While Credential is primarily made up of crossover acts, Forefront has long been home to explicitly Christian artists such as dc talk and Audio Adrenaline. It's also worth noting both of those bands are no longer going concerns -- well, there is always talk of a talk reunion -- and Rebecca St. James is infrequently releasing new music these days, leaving tobyMac and This Beautiful Republic as the label's standard-bearers for the moment. So Forefront could probably use another strong act, and Dizmas shows strength in what the label bought and promise for the future. The 10-song disc is essentially a best of Dizmas' two Credential releases, 2005's On a Search in America and last year's Tension, plus four new tracks. The quintet of tunes from Tension are the album's primary strength and reason for that wandering finger syndrome we mentioned. The songs from the previous records are billed as "remastered," and while sometimes you have to be a sound engineer to appreciate redone works like that, tunes such as Shake it Off do seem to have a bit more clarity and pop than their previous incarnations. Different is the best of the new bunch, with angular guitar parts showing some adventure in the band. The other three, Save the Day, Worth Fighting For and Yours, are also solid efforts that show a bit of mellowing and thoughtfulness in the band. Overall, the Forefront debut is a good Dizmas primer for folks who haven't tuned them in already. It'll be interesting to watch for the Lancaster, Calif., act's first full effort with the label to see where this move takes Dizmas and whether their music will still make us want to crank it up. Also out today: Former American Idol conten-dah Phil Stacey joins the Christian music fold with a self-titled debut; newcomer Josh Wilson also debuts with Trying to Fit the Ocean in a Cup; Salvador adds some Latin flavor with Aware and recent Rupp visitors pureNRG drop Here We Go Again. Top 10: P.O.D. 's When Angels and Serpents Dance became the latest album by a Christian market act to debut in the Top 10 of Billboard's general market album charts. The disc moved 34,000 units to check in at No. 9. Don't forget . . . to bug invite Air1's morning team of Eric and Coppelia to come to Ichthus. According to Air1 regional manager Mike Mankel, Lexington is one of Air1's largest markets, so there's another reason we should come. Click here for their e-mail . . . to pester ask Insight to add the Gospel Music Channel, so we can see the Dove Awards next year, and all the programming in between. The Kentucky Theatre's Summer Classics Series will truly live up to its name this summer with a lineup of 15 movies, most of which are indisputable classics. The list includes a strong reminder of what a banner year 1939 was for cinema and that 1960 wasn't bad either. There's also a movie I hate to say came out when I was in high school -- maybe we children of the '80s are just becoming "classic." May 28: Citizen Kane (1941) -- Is it, as many critics contend, the greatest movie ever? June 4: City Lights (1931) -- Charlie Chaplin as his signature character, The Tramp, in a beautiful story with an ending many consider the best in film history. 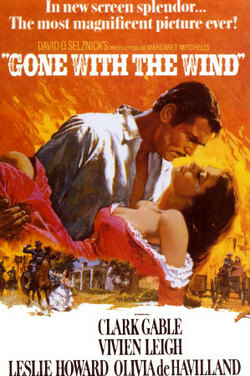 June 11: Gone with the Wind (1939) -- Great timing. GWTW finally comes to the Summer Classics Series right after Actors Guild of Lexington's production of Moonlight and Magnolias, which is about the writing of the script for the movie. June 18: Psycho (1960) -- Do you hear screeching violins now? June 25: The Wizard of Oz (1939) -- I said it before: You have not seen the arrival in Oz until you've seen it on the big screen. July 2: Back to the Future (1985) -- Honey! Fire up the Delorean. OK, my fellow children of the Reagan decade, here's the question: What other movies of our youth can now be considered classics? Please comment. July 9: Lost Horizon (1937) -- If you haven't seen a movie on this list, it's probably this one. Frank Capra's film about the lost world of Shangri-La is a wonderful journey. July 16: Spartacus (1960) -- All together: "I'm Spartacus." July 23: Casablanca (1942) -- Another great ending, and a movie that never gets old. 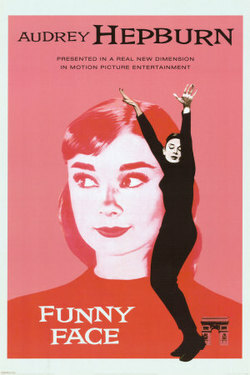 July 30: Funny Face (1957) -- You've seen the Gap commercial, now see Audrey Hepburn in the movie the "skinny black pants" footage originally appeared in. Aug. 6: Swiss Family Robinson (1960) -- You've seen Nim's Island, now see one of its inspirations. Aug. 13: The Magnificent Seven (1960) -- The American remake of Akira Kurosawa's The Seven Samurai (1954) has tough guys Charles Bronson and Steve McQueen and others defending a Mexican village against more than 100 marauders. Aug. 20: The Philadelphia Story (1940) -- The witty repartee of this high society comedy inspired George Clooney in making Leatherheads. Aug. 27: The War of the Worlds (1953) -- Can classic mid-20th Century sci-fi be more satisfying than Spielberg's 2005 spectacle? Sept. 3: West Side Story (1961) -- Natalie Wood stars in one of the best screen adaptations of a musical ever. 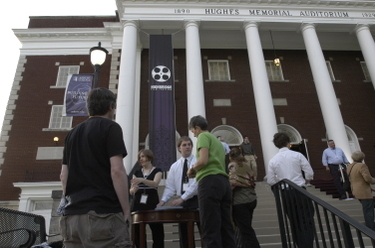 Above: Asbury film fans arrive at the Highbridge Film Festival Saturday night. Below: Jeff Day and Greg Bandy open the festival. Photos by Rich Copley | LexGo. WILMORE -- The red carpet was rolled down the steps of Asbury College’s Hughes Auditorium for Saturday Night’s Highbridge Film Festival. This was the fourth time around for the student film competition, and it felt like a strong taste of Hollywood glamour in small town Kentucky. Students streamed toward the auditorium, many dressed in probably the best things they had in their closets, to watch 11 student productions competing for the top honors. The star performer of the evening was Visceral by Brock Smith, which won six awards, including best drama and audience favorite. The action-packed short, in a sort of 24-esque vein, portrayed a man racing against time to save his wife from a biological threat. While the plot was a tad fuzzy, the action and sound production were spot on. But Smith’s was hardly the only strong production of the evening. Pencil Me In, from the trio of Austin Brooks, Ben Corwin and Jack Brannen also dazzled with its story of a man and woman who live by their planners – she is shown brushing her teeth and then crossing off “brush teeth” in her precious book – who eventually meet because of their identical appointment books. The film, largely shot at the Wilmore IGA, won honors for best comedy and best script. Our Kentucky girl Wynonna performs with Natalie Grant at the 2008 Dove Awards, Wednesday night in Nashville. All photos in this post are by Mark Humphrey for the Associated Press, and they are copyrighted. At first, it seemed like the only thing I was missing was the performances, as the early Dove Award winners seemed fairly predictable: Chris Tomlin is male vocalist of the year for the charming third time and Natalie Grant is female vocalist. Brandon Heath won new artist of the year, something of a surprise, but he was coming out of a field with no clear front runner. Here in Lexington, we don't get the Gospel Music Channel, which carried the awards live, on our cable system. So I was left updating the Associated Press site to get the word about how the Doves were going out of Nashville. But it seemed like what we without GMC were really missing were performances. ~ Amy Grant paying tribute to her former piano player, Michael W. Smith, along with former American Idol competitors Mandisa, Chris Sligh and Phil Stacey (right). ~ Switchfoot, Casting Crowns and others doing their own numbers. ~ Another all-star lineup, including Smitty, Tomlin, Israel Houghton, Christy Nockles and Paul Baloche. I'll have to listen up for my colleague from Jessamine County to tell me what it was like. But I also want to hear what it was like when TobyMac (right) won artist of the year. This was another honor Tomlin was starting to own, and it seemed Casting Crowns, if anyone, may have taken it away last night. But Portable Sounds and Toby's very successful morphing from band member -- he won artist of the year in 1996 as part of dc talk -- to solo artist seemed to have turned enough heads he got the hardware. AP reported he said, "Are you kidding? This is crazy, man. I thought I was Mr. Pre-Televised awards." Click here for the Nashville Tennessean's story, which includes a list of winners. And click here to tell Insight to get the Gospel Music Channel. 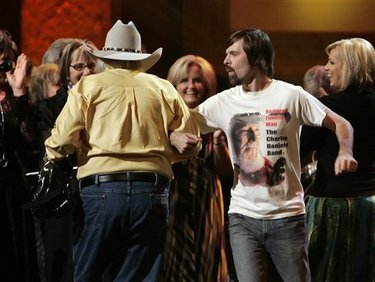 Third Day's Mac Powell (right) do-si-dos or swings his partner Charlie Daniels (left), or something like that at the Doves. Filmmakers (L-R) John and Brad Hennegan. Lexington had the second-highest grosses in the nation for The First Saturday in May, brothers John and Brad Hennegan’s documentary about the road to the Kentucky Derby. Only New York City had higher grosses, according to a spokesman for the Kentucky Theatre, where it's playing here in the Horse Capital of the World. Overall, the movie made $54,553 playing on 20 screens across the nation, including the Kentucky Theatre, according to Box Office Mojo. That gave it a $2,727 per screen average, better than half of the films in the Top 10, though those films did play on several thousand more screens. First Saturday, which follows six trainers in their quest to take a horse to the 2006 Kentucky Derby, checked in at No. 53 on the weekend box office charts. It is still playing at the Kentucky Theatre at least through May 1. Even if you are not a horse racing fan, First Saturday is an intriguing, irreverent ride. And if you are, it'll still probably tell you a lot of things you don't know. Click here to read our review and here for our feature on the Hennegan Brothers. Matt Maher has been writing Christian hits for a while. Now he has a solo debut, Empty & Beautiful. Copyrighted photo by Micah Kandros | Essential Records. 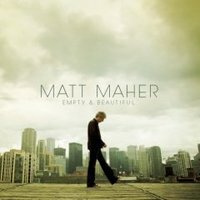 At first spin, Matt Maher's Empty & Beautiful will sound familiar. That's probably because, several of the tunes on the disc have been recorded by other artists, including Chris Tomlin and Bethany Dillon. Maher established himself as a prominent songwriter in arenas such as the Passion movement a while ago, and he has a few independent releases under his belt. The great thing about his Essential Records debut as a performing artist is that Maher has now consolidated his music to one disc and offered up more songs and more personal songs such as the title track. Grace is the dominant theme here, on songs such as Empty, the spirited Look Like a Fool and leadoff track Your Grace is Enough -- previously recorded by Tomlin. Like Tomlin, Maher the performer becomes a quick companion, articulating truths and speaking to the soul with memorable hooks. Maher is obviously a skilled musician, and his background, which includes studying jazz piano at Arizona State University, indicates he may be able to range wider on future releases. He is also a thoughtful songwriter, using Biblical passages as a basis for numerous tunes such as the Ecclesiastes-based For Your Glory. There's also this ineffably cool thing about a songwriter who can share his or her songs really well. It's been great to have Maher's songs in Christian music, it's even better to have his voice. Papalpalooza: Masses, requiems and chants are the kinds of music that are often associated with the Catholic Church. 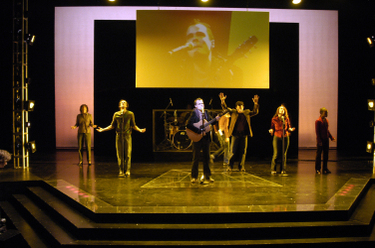 But a group of Christian musicians, including Maher, who is Catholic, played for a youth rally in Yonkers, NY connected to the visit of Pope Benedict XVI. Third Day, tobyMac, Salvador and American Idol champ Kelly Clarkson played the event dubbed Papalpalooza. In a story by Billboard magazine's Deborah Evans Price, Maher said, ""It's an opportunity for the country to see there is a young Catholic Church and they are passionate about what they believe. It's a chance for them to look around and say, 'I'm not alone in my convictions. I'm not alone in my beliefs.'" Dove Awards good news: The Dove Awards are at 8 p.m. Wednesday night. Live from Nashville, the lineup will include Casting Crowns, Switchfoot, the David Crowder Band and Kentucky's own Wynonna Judd with Natalie Grant, plus a tribute to Michael W. Smith by Amy Grant and American Idol finalists Phil Stacey, Mandisa, and Chris Sligh. Dove Awards bad news: If you don't get the Gospel Music Channel, you ain't watching it. And here in Lexington, with Insight as our cable provider, we aren't getting it — I know, Jessamine County, I already had a co-worker taunt me that their Time Warner Cable gets it on Ch. 135. DirecTV satellite subscribers can also get GMC on Channel 338. So, if you are a Lexingtonian, this might be an opportune time to lobby Insight for the Gospel Music Channel. You can send a note through the channel's Web site or by calling Insight at 1-800-273-0144. Amazon has a Dove Awards store, in case you need to catch up on some music. Here at le blog, we'll have the winners posted on Thursday morning. 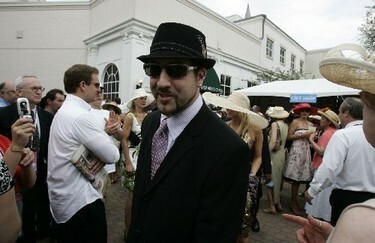 Former 'N Sync member and "reality" TV star Joey Fatone has become a regular at the Kentucky Derby. If he shows up this year, chances are you'll see him on NBC's Derby red carpet show, Access at the Kentucky Derby. Copyrighted Herald-Leader photo by Charles Bertram. Red carpet shows used to just be the province of award shows and premiers. But as coverage of the Super Bowl earlier this year showed, sports events are getting a piece of the celebrity-walk action also. This year, the Kentucky Derby is getting in on the game. NBC produced Access Hollywood will present an hour-long red carpet show, Access at the Kentucky Derby. Host Billy Bush (photo, right, courtesy NBC-Universal) will be on the ground in Louisville, bringing celebrity sightings from Churchill Downs on Derby Day as well as a look at all the parties preceding the Run for the Roses. The network coverage starts at 4 p.m., following a day-long sprint by the WLEX news crew. In a press release, Bush boasted, "Nobody looks better wearing an ascot and holding a mint julep than me." I'm sure there are some Kentucky gentlemen who may beg to differ. Secretariat should have run as well as Allegro did in my bow tie poll, and Obama or Clinton would love to get the percentage of the vote (62 percent) that my winning cravat earned. Being a music guy, it is a fairly appropriate winner, allegro being a brisk, lively tempo. So, now I am going to order my tie, and then start the search for a brisk, lively horse to put a few bills on next weekend. Thanks to everyone who voted, and I really enjoyed some of the commentary, like bright colors vs. a more conservative take. For the record, Ravenna and Derby Line tied for second and Shelburne never got out of the gate. I'm a bow tie guy. Check out Camille Weber's illustration at the top of this blog. That butterfly is there for a reason. And most years, I use Derby as an excuse to add to my collection. Some years, it's been a modest tie like 2006, when picked up a nice little lime green and royal blue stripe number at Logan's. A couple of years earlier I went with a flowery number dubbed, "The Mystery Machine tie." 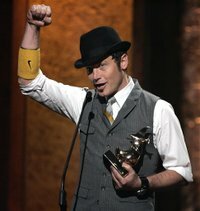 So, this year, I'm going to be your Derby culture blogger, and since I always have a hard time making up my mind about what tie to get, I'm asking you to help me. In consultation with Harriet Hendren, the author of our fabulous Fash Food blog, I picked four finalists from my favorite bow tie e-tailers, Beau Ties Ltd. and Bow Tie Club. 1. Derby Line - It has it's obvious selling points for the first Saturday in May, including a fashionable color. My fear is it's listed as a top seller at Beau Ties, and I don't want to show up wearing Derby Line and my seersucker suit and run into a dozen other guys wearing Derby Line and seersucker suits. 2. Allegro - Being a music guy, I like the name of this tie -- yes, these folks name their designs. I also like the swirly pattern and the colors would go well with seersucker or khaki, which is what I'll wear if Derby Day is less than sunny and warm. 3. Shelburne - The is a bit more calm than the other prints I'm looking at, but I love the colors and design. The Mystery Machine tie told me you can get a bit too wild. 4. Ravenna - Is this too wild? When I get a Derby tie, I'm also trying to fill in holes in my collection. I don't have a paisley bow tie, and I like paisley. OK, so, help. Comment (below) or send me an e-mail by noon Monday and tell me which one you think is right for me for Derby day. I can't offer fabulous prizes, but I do value your opinion. And keep checking back here for off-the-track Derby updates. We're starting to hear stuff about events, celebs, etc., and we'll try to keep you in the loop. Amber Rhodes and Josh Rush work on writing a song together at the offices of Sharp Objects, a song plugging agency in Nashville, in January. Copyrighted LexGo photo by Rich Copley. Lexington's Amber Rhodes is an American Idol finalist. No, Idol addicts, you have not been sleeping through a contestant every week. Rhodes, a SCAPA graduate and budding country artist, is in the running for the American Idol Songwriter competition. The contest, which is happening online through April 23, is to choose a new tune that will be sung by the winner on the American Idol finale. Rhodes' song is We're Gonna Make It, which she co-wrote with writers Hugh Colocott and Noel Cohen. 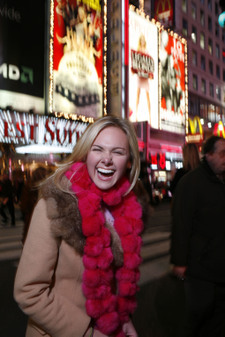 In a press release, Rhodes says she wrote the song for her boyfriend in New York. "What is a personal message for me may become a powerful message for all of America! How special is that?" Well, first, she has to beat out 19 other contenders at the competition's website. If you are not already registered with Idol, you'll need to sign up, and then launch a player that will take you through the tunes and let you vote on them. Has Jamie G really moved up? A few weeks ago, we bid farewell to intrepid Herald-Leader culture writer Jamie Gumbrecht, who took a job at the Atlanta Journal-Constitution. At the time, it seemed like a no-brainer -- bigger city, bigger opportunities. But, looking at the video of Jamie jumping into the "grit pit" in Warwick, Ga., we must ask, is she truly in a better place? P.O.D. 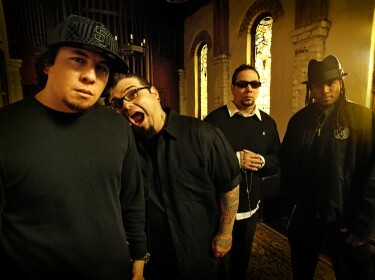 is singer Sonny Sandoval, guitarist Marcos Curiel, drummer Wuv Bernardo and bassist Traa Daniels. Copyrighted photo courtesy of INO Records. What better way for a band to say welcome back to its returning guitar player than to give an entire new album to the guy? After P.O.D, experienced massive success with Satellite in 2001, guitarist Marcos Curiel left the band or was kicked out, depending on who was telling the story. While his replacement, Jason Truby, was interesting and creative, it wasn't the same group. It wasn't the same arresting and immediate music that propelled them to the forefront of the Christian music market and made them significant players in the mainstream as well. The P.O.D. saga -- and most of the Yankees teams of this century -- is proof that you can have all of the talent in the world, but in a group, you have to work great together. So, on their new album, When Angels & Serpents Dance, how is the reunited quartet that brought us Satellite -- which I still consider the greatest Christian rock album ever -- and 1998's The Fundamental Elements of Southtown? Well, it's not exactly 2001 again. Rather than guys in their 20s singing for the "youth of the nation," Sonny, Marcos, Traa and Wuv are guys in their 30s, and their songwriting reflects larger (The End of the World) and more adult concerns (It Can't Rain Everyday). Rain actually sounds a bit like an updating of P.O.D. 's 2001 hit Youth of the Nation, which had a kid skating off to school and into a classmate's gunfire and a girl being sexually abused by older men. In It Can't Rain Everyday, we have a miscariage and a man losing his job. Not quite as dramatic, unless you appreciate the huge mature concerns those situations address. Addicted, the opening cut, is a pretty sober assessment of the grip drugs, alcohol and other vices can have on people, and the pain of an addict's friends and loved ones watching him or her in that grasp. Roman Empire also throws back to a classic P.O.D. form, the instrumental with just a little vocal touch. It is really a canvas for Curiel to paint, as is much of the album. Most of the tracks on When Angels & Serpents Dance are defined by the six-string colors this creative ax man brings to them, be it the garage band crunch of Kaliforn-Eye-A, the Latin and somewhat classical style of Roman or the gentle acoustic drizzle of Tell Me Why. No, P.O.D. is not completely back. The bluster of their youth frequently yields to an encroaching maturity, and the band is in the midst of a journey. The good news is Marcos is along for the ride. Speaking of musical chairs: Delirious?, which we reviewed here a few weeks back, has a new man in the drummer's chair: Paul Evans taking over for the amicably departing Stew Smith. End of an era: Most subscribers have now received the final print edition of CCM Magazine with CeCe Winans, Steven Curtis Chapman, tobyMac, Michael W. Smith, Amy Grant, Aaron Gillespie and Mark Hall on the cover. Some cool items in it are an essay by original CCM editor John Styll, now president of the Gospel Music Association, on the mag's history; a glance into the crystal ball of contemporary Christian music by Charlie Peacock; and a letters to the editor section with people -- including Addison Road frontwoman Jenny Simmons -- begging the printed magazine not to go. I have to agree. I don't know what financial pressures were impacting CCM, but strictly from a journalistic standpoint, it is too early for the primary publication about Christian pop music to go web only, and to be blunt, their website is not developed well enough that it can adequately substitute for the print product. The move deprives the genre of a definitive monthly document of its status and its progress, and though I love this cyberforum, I firmly believe the idea that everyone is on the web and gets all of their information from the web at this point in time is vastly oversold. A lot of people do, but not everyone. It was heartening that at a meeting I recently participated in with some of Lexington's brightest teens, a number of them said they still get their information about what to do from our print products. Dealing with Christian music publicists, when I run a review on this blog, they invariably ask if it will run in print. And that Letters to the Editor section and other comments in CCM were evidence that a lot of us eagerly awaited our monthly CCM to see who was being reviewed, what was in the news section and who was on the cover. That's coming to an end too soon. University of Kentucky Theater Department Chair Nancy Jones introduces retired theater professor James W. Rodgers and playwright Andrew Shafer before the world premier performance of Shafer's Weak/Side/Help, which won the Rodgers Playwriting Competition. Copyrighted LexGo photo by Rich Copley. Before the world premier of his new play, Weak/Side/Help, playwright Andrew Shafer sat down with University of Kentucky Theater Department Chair Nancy Jones to discuss his show, which won the second James W. Rodgers Playwriting Competition. 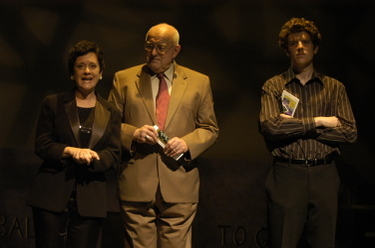 In the chat, before a group of invited guests at UK's Briggs Theatre, Shafer's comments concentrated on his desire to be a new voice in the theater world. "I want to completely revolutionize theater," Shafer said. "That may sound arrogant, but if you are not there to totally push the form, I don't see why you are there." His play, which continues Thursday (April 17) through Sunday (April 20) at UK's Guignol Theatre,certainly brings some topics to the table that don't get discussed a lot in the theater: America's obsession with sports and issues in the sporting world such as performance enhancing drugs and racism. Adam Luckey had given up on theater. He’d been a high school thespian, and enjoyed it. But he thought his real life, his adult life, would take another path. Then he took a theater history class at Transylvania University from David Haller (Copyrighted Herald-Leader file photo by Frank Anderson, right). The Lexington stage career of Luckey, regarded as one of Lexington’s best actors, is just one of the many legacies Haller leaves, following his death from complications from pneumonia April 2. He was 76. You could often count on seeing Doc Haller in the audience at Transy shows, where he directed the theater department for 23 years before retiring in 1994. “He left a tradition of excellence in productions and courses, and certainly the promise of a new theater,” Haller’s successor, Tim Soulis, says. “I always felt guilty that the same year he was leaving, Lucille Little committed to giving the school $1 million to build a new theater. Ryan Harr, as sleazy reporter Stephen Detwaller, questions Jeremy Jarmon, as troubled quarterback Tyrone Wilmot, in Andrew Shafer's Weak/Side/Help. Copyrighted LexGo photo by Pablo Alcala. They call it stunt casting: putting someone in a role for their ability to generate interest and ticket sales, not necessarily their ability to act. On paper, that's how you could interpret the University of Kentucky Theatre's decision to cast UK football player Jeremy Jarmon in its new play about college football. But if this was a stunt, a theatrical Evel Knievel, then Jarmon cleared the gorge, did a few donuts with the motorcycle to kick up a spectacular dust cloud and pumped his fists in victory. Jarmon was actually a lot more humble during the curtain call for his successful UK stage debut. But his performance in the world premier of Andrew Shafer's Weak/Side/Help was the highlight of this night at the theater. No. 99, when he suits up for the Wildcats, was the best prepared, most commanding and convincing player on the stage. It was a brave role for Jarmon to take. The play, which won the second James W. Rodgers playwriting competition, is about a major college football program that becomes embroiled in performance enhancing drug and racial scandals. Tyrone is an explosive player who starts the play implicating his rival for the quarterback spot in steroid abuse during an interview with a newspaper reporter. That moment brings the play to life after a weak opening, and Jarmon dominates all his scenes, including an intense confrontation with said rival quarterback, played by Alex Koehl in one of the play's other standout performances. 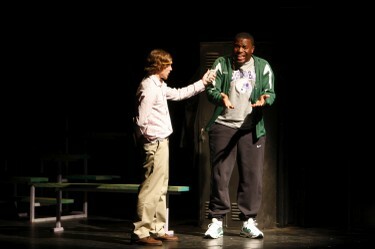 While he often had to convey strength, Jarmon also had to portray some vulnerability, asking a team assistant to get him drugs, and he played the victim in the play's shattering revelation. It all rang true. This is not entirely surprising. Football fans got to see film of Jarmon performing the "You can't handle the truth!" scene during UK games last fall -- ironic, since people's inability to handle truth is one of the themes of this play. The defensive end was an actor in high school, and according to UK theater department chair Nancy Jones, he said he had been interested in auditioning for the Fall 2006 production of A Raisin in the Sun, except it conflicted with the football schedule. UK Theatre should look for another chance to work this multi-talented student into a show. This casting was an attention grabber. 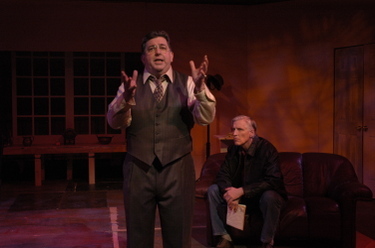 The only other time I've seen TV cameras in a Lexington play was when UK Theatre presented celebrated Kentucky novelist Silas House's playwriting debut, The Hurting Part, in 2005. The good news is, like that play, Jarmon's performance was worthy of the attention. Read: UK football beat writer Chip Cosby's story about Jarmon's UK acting debut. Coming Sunday: Check out the Arts+Life section and LexGo for more on Shafer and the Rodgers competition, and look here for thoughts on the play and highlights of Shafer's pre-show chat Thursday. 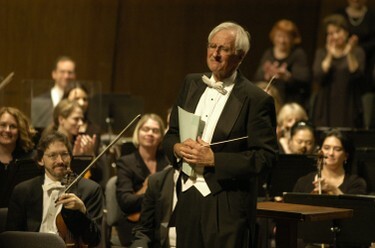 Lexington mayor Jim Newberry released his budget for the fiscal year 2009 Tuesday, which means LexArts got news about the Lexington-Fayette Urban County Government's contribution to its Campaign for the Arts. For the most part, it sounded like a repeat of last year, minus $50,000-to-$100,000, depending on how you take it. The LFUCG is set to give LexArts, pending Lexington-Fayette Urban County Council approval, a $350,000 contribution to the campaign, and it has issued a $100,000 challenge grant. Last year, the Mayor (copyrighted photo, right, by David Perry) gave the campaign $350,000 and issued a $150,000 challenge geared toward attracting new donors to LexArts. The group met the challenge in September. Q: How do you feel about the $350,000 contribution to the campaign? A: I am pleased the Mayor Newberry maintained LexArts’ base level of support. Knowing the Mayor would be hard pressed to provide the same package as last year ($350k base with $150k Challenge), we budgeted just for the base amount. Q: Where does that set the campaign in relation to the goal? A: We are now just $50k short of the goal which is $1,125,000. Q: What is the nature of this $100,000 challenge? Is it another new-donor drive or something different? A: We have not discussed the details yet, but I am aware that Mayor Newberry wants to work with us to craft a plan that helps us attract new or increased gifts – last year we focused only on new gifts which were capped at $1,000 per donor. Q: How do you feel about having another challenge this year? A: I feel great and grateful. This is a difficult budget year, yet the Mayor has maintained his commitment to the arts and culture as part of his economic development strategy for Lexington. The arts and culture are integral to enhancing the quality of life and making this place attractive to businesses. Q: When does the campaign end? A: The official end date is April 15 and it looks like we are going to be able announce GOAL on that date – of course, we will accept gifts after that date, right up to the end of our fiscal year, June 30. Eric Allen and Coppelia with Stellar Kart, which will be at Ichthus. Left to right: Brian Calcara, Coppelia, Adam Agee, Cody Pellerin, Eric and Jordan Messer. 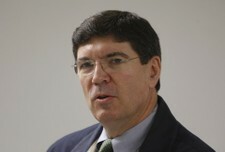 Photo from Air1.com. So, this morning around 7:15, the Air1 morning team of Eric and Coppelia started giving a shout out to Lexington and Danville -- many thanks -- which quickly evolved into a discussion about how maybe they ought to come to the Ichthus Festival. Well, you oughtta! You mean you don't have your plane tickets yet!? OK, they sounded a tad on the fence about the deal, so I suggest we show the California duo some good ol' Southern hospitality and invite them. Really, Jeff James won't mind. Why would they want to come? Well . . .
~ It is the oldest Christian pop festival on the planet, Janet, so come engage with some history. ~ From the mainstage area, you can see cows grazing in the distance. Do that at AtlantaFest. ~ The headliners: Casting Crowns, tobyMac and Jeremy Camp. That's some good headlining. ~ You can drink Ale-8-1 at Ichthus. Do that at Cornerstone. ~ Did we mention David Crowder, Kutless and Skillet? ~ We'll take you out for Hot Browns, something not served anywhere near Creation -- either Creation. ~ The Ascenxion competition winner will play Friday evening -- great chance for you guys to discover a new band and talk them up on air. ~ Michael W. Smith came to Ichthus before he was Michael W. Smith, so if it was good enough for Smitty . . .
~ It has not rained at Ichthus in two years. Seriously. ~ Don't you think the nation wants to hear, "Live, from Wilmore, it's Eric and Coppelia!" Obviously, we think so. So send the guys some e-mail. Comment on their blog. Remind them the center of the Christian rock universe will be Wilmore June 11-14, so they might as well be in it. I also want to ask Coppelia if her folks were big ballet fans. The First Saturday in May has been making the film festival rounds and getting rave reviews around the country. April 18, the documentary following the run-up to the 2006 Kentucky Derby will open at -- appropriately -- the Kentucky Theatre. Brothers John and Brad Hennegan spent 16 months traveling around the world to document the major races leading up to the Derby. The film reportedly includes footage of a young Barbaro, before his thrilling victory in the 2006 race and untimely death after breaking down in the Preakness Stakes. (After playing the trailer, above, you'll get a menu of clips from the movie in that window, including serveral Barbaro scenes.) Lexington will be among a select group of cities, including New York and Los Angeles, seeing the movie, which opens in limited release on the 18th. "Indeed, the journey is nothing short of riveting. The Hennegans, sons of a horse racing official, used their vast knowledge of the sport and incredible access to paint vivid portraits of colorful characters. For fans who see this movie, the Derby will never again be just another excuse for a party." 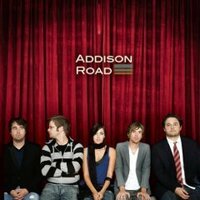 Addison Road is drummer Jeff Sutton, bassist Travis Lawrence, lead singer Jenny Simmons, guitarist Ryan Simmons and lead guitarist Ryan Gregg. Photo by Tec Petaja | INO Records. Funny thing about bands that enjoy head-turning grassroots success before they ink deals with major labels: They usually turn out to be fairly regular folks, and not the kind of people who would impress record company executives as the next rock stars. Look at Hootie and the Blowfish, the Dave Matthews Band or, in the genre of which we currently speak, the David Crowder Band, Caedmon's Call and Casting Crowns. Not rock stars from central casting, but musicians who have an amiable stage presence and a way with a tune. Addison Road fits right in with that m-o. The band formed in 2001 when Jenny and Ryan Simmons -- not married then, but married now -- got a gig before they even had a band. 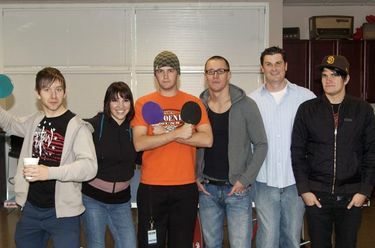 So, the then-Baylor students put together a group that has since morphed a bit over the years, dropped three indie releases and now has a major label debut on INO Records -- which brought you more unassuming stars in MercyMe. The self-titled album is a solid effort of pop rock that is at its best when it is speaking in the plainest terms. What Do I Know of Holy is a prime example, with Jenny singing about a relationship with God that often seems difficult, awkward and unreal. It's introspective writing from the Nichole Nordeman school. Casualties is a catchy and thought-provoking piece about people losing their personal and spiritual relationships to our go-go American culture. The current hit single, All That I Know, may a bit misleading giving folks the impression Addison Road is cut from the Krystal Meyers and Fireflight rocker-chic mold. But Ryan Gregg and Ryan Simmons Beatle-esque guitar flourishes hint at the greater picture, which is a real diversity of material for debut album. Then again, these folks have been working on this record for a while. 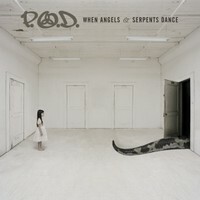 Out today: P.O.D. 's When Angels & Serpents Dance is in stores, online, and everyone else seems to be staying away from the week like it was the release of a new Spider-Man movie. We'll have a review of the Boys from the South next week. Coming soon: The labels are already whetting our appetites for upcoming releases. Third Day's Revelation, the Georgia band's first album since its two-disc greatest hits package, is set to release July 29 with production by Howard Benson, whose credits include Daughtry, P.O.D. and Flyleaf. And some of those acts showed up on Third Day's new saucer, including Flyleaf's Lacey Mosley for two tunes and Chris Daughtry on one. Overall, they're promising a grittier, Southern rock sound. Family Force 5, also hailing from the Atlanta area, is slated for a late summer release also, though we don't have an album name or date yet. It'll be an interesting release for FF5, which was voted artist of the year by CCM Magazine readers and then greeted two months later with a page full of letters to the editor denouncing the band's look and message -- or perceived lack thereof. It'll be interesting to see if a new release offers anything to satiate the band's detractors. Got VBS crafts? : This isn't Christian pop related, but I figure some of you may have some ideas for this: Our Faith & Values editor is looking for great Vacation Bible School crafts for a feature later this spring. If you have an unusual craft that others might be interested in, please let us know. Briefly describe the project including the materials involved, the age-appropriateness, how long it takes to create and the end-result. You can e-mail that to me, and I'll send it along to the right person. Thanks, and we can't wait to hear about cherry Jello Red Seas and stuff. In one of Jamie Gumbrecht's photos from Iraq, Staff Sgt. James Rawlings, right, talks with Capt. 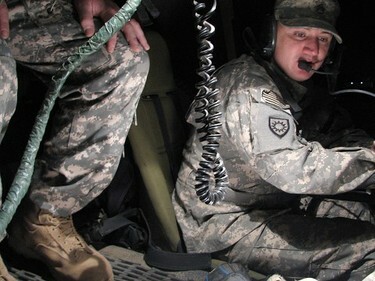 Steve Mattingly through a headset before a convoy security mission on Dec. 12. After sitting next to Jamie Gumbrecht for three years, it was lots of fun to TiVo her name and get a result. Yes, Jamie G is gone to Atlanta, but one thing she left behind was her interview with Bill Goodman for his One to One program. It aired over the weekend on KET, but being completely out of touch -- read: on spring break -- I missed that airing. But the show repeats at 7:30 tonight (Tuesday, April 8) on KET2. Jamie will be discussing her experiences during six weeks in McClatchy News Service's Baghdad Bureau. In the office, we heard many of Jamie's stories in the weeks between her return and her departure for Atlanta, where she now works for the Atlanta Journal-Constitution. Some were funny, some were bizarre and many were poignant. They were all interesting. I don't know what, exactly, she discussed with Goodman. But I'm sure you'll find the same if you tune in tonight. 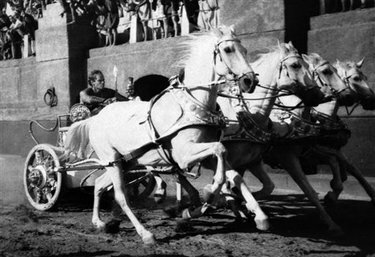 Charlton Heston is one of the great scenes in film history: the chariot race from Ben Hur. 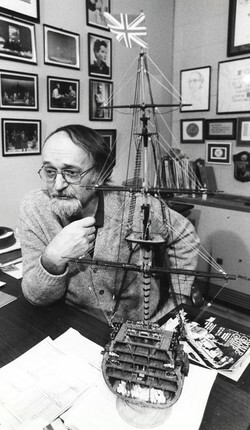 Below: Heston in 2002, by Uwe Lein. Both photos from the Associated Press. As I've written before, I felt lucky to have grown up at the end of an era where you could see classic cinema on a movie screen on a regular basis. One of the crystalline silver screen memories I have as a boy was going to the Pembroke Mall Cinemas near my home in Virginia Beach, Va., where the screen went from the high ceiling to the floor and across the curved back wall. It was the place to see an epic, and I was in for one with Ben-Hur, the 1959 William Wyler classic of chariot races, amazing journeys, big emotions and Jesus Christ himself. 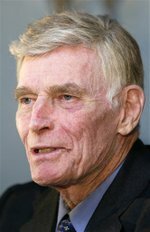 At the center of it all was Charlton Heston, an actor who -- though I wasn't conscious of it at the time -- drew me in with an Oscar winning portrayal of a man wronged by his best friend who fights through the harshest of circumstances to regain his life and family and ultimately has a life-changing encounter. Prior to that afternoon, I had no idea a terrestrial tale could dazzle me as much as Star Wars, but Ben-Hur did it, and Heston was on my radar as a star to follow. It was a trip over the years through more epics (El Cid), the bizarre (Soylent Green . . . is people!!! ), great movies (Touch of Evil) and cheese whiz (Airport). Heston's image has also undergone a transformation in the ensuing years. He went, in many circles, from being regarded as the great movie star that he was to a pariah and a punchline. Granted, he brought some of this on himself, primarily for his presidency of the National Riffle Association and outspoken advocacy for gun ownership rights, a divisive issue, no doubt. You have to accept when you make stands, some people will make a complete break with you and not be able to see anything but your politics, even when they are watching you in a great performance. Give Heston credit: He stood up for something he believed in, just like he did in the 1960s, marching for civil rights. In this corner, we have never been against artists putting their names behind causes they believe in. But let's not forget Heston's acting and his contributions to cinema. He was one of the 20th Century's great movie stars, and now that he's gone, he should definitely be remembered as such. Click here for a list of Heston's major motion pictures. Fans in Maysville were wild about George Clooney and his new movie, Leatherheads, at a March 24 premier. But moviegoers across the country were cooler to the comedy about the early days of the National Football League. Copyrighted LexGo photo by Charles Bertram. George Clooney's Leatherheads was all the rage here in Central and Northern Kentucky for a week when the star brought his movie back home for a little Hollywood on the Ohio River. But the film failed to generate the same excitement across the country as ticket buyers elected to see MIT students beat the system in Vegas, handing 21 its second consecutive weekend box office victory. The ominous signs started gathering Friday for Leatherheads, Clooney's third directing effort and first bona fide comedy. Though Gorgeous George sat through a complimentary review from the Today show's Gene Shalit, most critics were tougher on the flick, calling it labored and a fumble. Jim Emerson, writing for Roger Ebert's website, was a bit more complimentary, mainly of Clooney, essentially saying that the star kept Leatherheads in the game all by himself. And the Los Angeles Times' Carina Chocano called it charming and wondered why there aren't more movies like it. I was sort of in the same boat, appreciating the old-timey fun but thinking it was too long and comically out of sync. Moviegoers just didn't seem interested in huge numbers, as the flick took in an estimated $13.5 million, just under a safety behind 21's $15.1 million, and a hair ahead of the Abigail Breslin-Jodie Foster family flick, Nim's Island. Yahoo Movies and other sources report that when official numbers are released today, Leatherheads could drop to third, behind Nim. Industry experts seemed to attribute Leatherheads' fumble to its appeal to older moviegoers, who are often a bit harder to lure out of the house, while college-oriented 21 was right in the cinema strike zone -- wrong sport, I know. UPDATE: When the official numbers came in, Leatherheads ($12.68 million) did indeed fall behind Nim's Island ($13.21 million), making the Clooney pic No. 3 for the weekend. 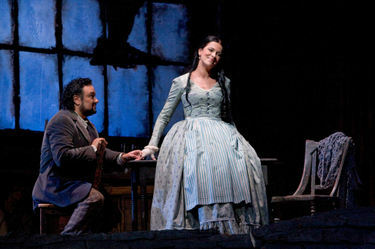 Ramon Vargas and Angela Gheorghiu in the Metropolitan Opera's production of Giacomo Puccini's La Boheme. Copyrighted photo by Marty Sohl | The Metropolitan Opera. We're getting into springtime, where weekend matinées can be a harder sell, and that could really be true here in Central Kentucky, where we'll emerge from two days of soaking rains -- I just discovered I have waterfront property -- into what looks like a gorgeous weekend. But if you're an opera fan willing to give up a few hours of 60s and sunny, your reward would be Angela ­Gheorghiu as Mimi and Ramon Vargas as ­Rodolpho in La Boheme, the seventh ­offering in the Metropolitan Opera's Live HD series. This is the Franco Zeffirelli production, which just became the longest running production in Met history. It shows at 1:30 p.m. Saturday at Hamburg Pavilion 16, Lexington Green Movies 8 and Richmond Mall ­Cinemas 8. There's an encore showing at 3 p.m. April 6 at Lexington Green and Richmond Mall. Tickets are $22 for adults, $20 for seniors and $15 for children. Click here for online ticket info for anywhere in the United States. If you're inclined to listen to the performance, say, cleaning out your garage or doing something else springy, this performance will also be broadcast on WEKU - 88.9 FM. We can't go back in time to see how Wolfgang Amadeus Mozart and Lorenzo Da Ponte created their masterpieces. 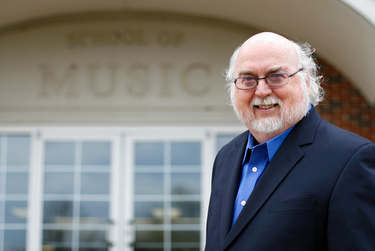 But you can check out how composer Joseph Baber, librettist Jim Rodgers and the University of Kentucky Opera Theatre are creating their new opera, River of Time, at an upcoming event. Commissioned operas are something of a rarity for college opera outfits but the 200th anniversary of Abraham Lincoln's birth seemed to be the right occasion. The opera, which a local audience got a preview of at the Our Lincoln concert in February, looks at Lincoln's formative years in Kentucky. It will premier next spring. 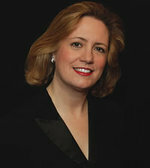 How Opera is Made will be presented at in the Singletary Center for the Arts recital hall from 12:30 to 2 p.m. Thurs., April 3, and from 7 to 8:30 p.m. Friday, April 11, at the Carnegie Center for Literacy and Learning. It will feature Baber, Rodgers and others talking about the creative process behind their work in progress. Both events are free and open to the public. Call (859) 257-9331 for additional information. Photo above: Mark Golson and Denisha Ballew in a scene from River of Time at the Our Lincoln event in February. Copyrighted Herald-Leader photo by Joseph Rey Au. 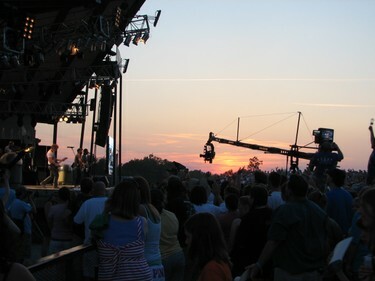 Chris Tomlin in the best way to hear him, live, playing to the crowd at sunset at Ichthus 2007. Copyrighted photo by Rich Copley | LexGo. We don't review many hits discs or live compilations here. Cranking a review a week, it usually seems best to focus on the new albums from individual artists with tunes that may someday end up on hits or live discs. But there is something about the Passion albums, including the latest, God of this City, that merits mentioning. 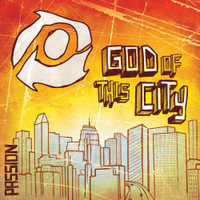 The Passion albums really serve as a great record of where modern worship is at, and God of this City is no exception. Even if you have most of these tunes on other albums, this one is worth the investment. Out today: Delirious's Kingdom of Comfort, Hawk Nelson's Hawk Nelson is my Friend, Sarah Kelly's Born to Worship, Underoath Live and Jars of Clay's Greatest Hits. 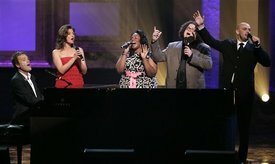 ~ If you're inclined to go to the Dove Awards, or if you are going to watch it live on the Gospel Music Channel at 8 p.m. April 23, you'll get to see a lineup of performers including Casting Crowns, Michael W. Smith, Amy Grant, Switchfoot, Marvin Sapp, Steven Curtis Chapman, David Crowder Band and Third Day's Mac Powell with the Charlie Daniels Band. ~ A few weeks ago we mentioned Lexington's own Kahle Reardon appeared in Fireflight's Unbreakable video. We finally have a link to the video -- caution, it takes a minute or two to load, and I have cable broadband at home. According to the Kahle's mom, she appears about half way through the clip, after the, "bald woman." ~ Toby McKeehan's Gotee Records has bought back its minority stake from EMI Christian Music Group, making it a fully independent label. This is mostly record industry inside baseball, but it is interesting that the label that has brought us acts such as Relient K has been successful enough to part from one of the major majors in the Christian music world and go its own way. The language of the press release puts an emphasis on digital content and, apparently, a steadier stream of new music from label artists. Upcoming projects this year include new albums from Family Force 5 and Ayiesha Woods.